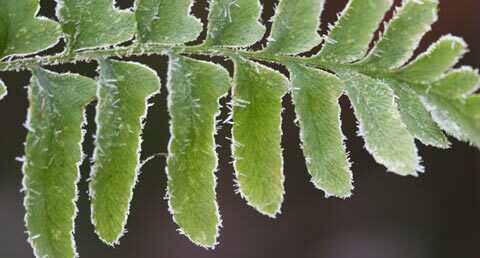 The Christmas fern reaches 10 to 60 cm long with fronds (leaves) that have approximately 20 to 40 pairs of pinnae (leaflets). The pinnae are pointy at the tip, while the base has an upward pointing lobe that resembles a thumb in a very long mitten or toes in a sock. The upper pinnae of several fronds are fertile and much smaller, bearing the sori (spore clusters, similar to seeds) on their undersides. Habitat: It typically grows in hardwood stands, where it gets a good dose of mulch when the leaves fall each autumn. 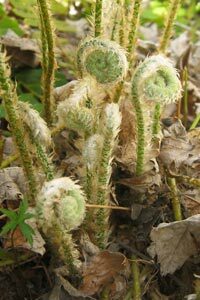 In addition, the fern’s own leaves turn brown and serve as mulch by the time the new shoots – or fiddleheads – emerge in the spring. It can also be found in humus-rich rocky crevices or along stream banks where it is cool, moist and shady. The Christmas fern offers cover for wildlife, which can hide under the fronds. It is also a source of food for some animals such as the ruffed grouse. It’s winter in Canada and there’s a light layer of snow on the ground. You go for a walk in the woods and notice with surprise a vibrant green leaf peeping through. Depending on where you live, it could very well be the Christmas fern, or Polystichum acrostichoides. The Christmas fern probably got its name thanks to its evergreen qualities, which made it a popular material for Christmas decorations. Or it could be due to the shape of its pinnae (leaflets) that look a bit like Christmas stockings. 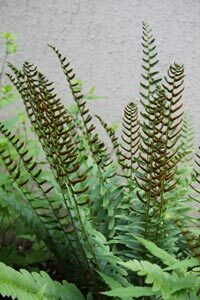 Either way, it is a delightful fern to grow, either as an accent plant or, with sufficient propagation, as a filler in a shady corner of the garden. new shoots – or fiddleheads – emerge in the spring. It can also be found in humus-rich rocky crevices or along stream banks where it is cool, moist and shady. 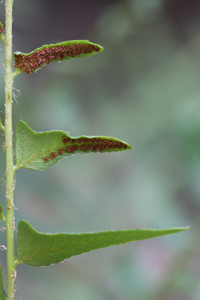 These appear reddish-brown and grow in two rows, although it is sometimes hard to see each row clearly. Once used as a decoration at Christmas, Polystichum acrostichoides offers cover for wildlife, which can hide under the fronds. It is also a source of food for some animals such as the ruffed grouse. You can divide established plants in the spring by digging up and separating their rhizomes (fleshy roots). Alternatively you can scatter the dust-like spores on rich moist soil. This method is more pernickety in that once the spore germinates it creates a prothallus, or gametophyte, which is tiny and plant-like. It needs moisture to fertilize itself, then creates a brand new Christmas fern. Image 4 can go anywhere around here to fill a hole, but not in the “Other species” section. Christmas ferns are an attractive fillers of shady garden spots, be it partial or deep shade. It likes well-drained soils, preferring rocky, sandy or loamy areas that are cool and moist. It does well with mulch, so try mimicking its natural habitat by growing below hardwood trees or gather leaves in the fall to place around the plant. Appearance: smaller fern, growing to approximately 40 cm high, and the fronds are narrower than those of the Christmas fern.